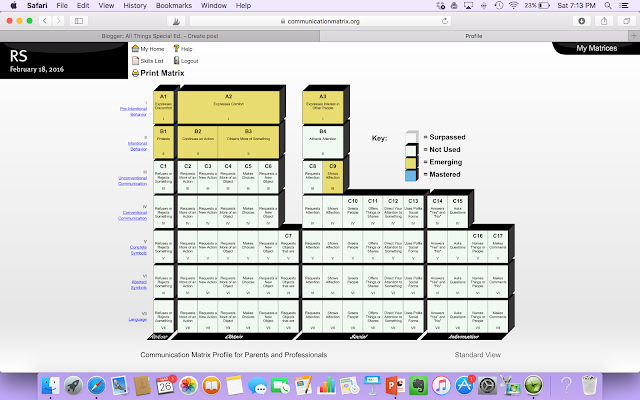 Communication Matrix - All Things Special Ed. Do you work with severe/profound students? A challenge you may have when working with this population of students is how to measure their communication. Well after attending a PD opportunity back in February- I am excited to share a little more information about this FREE on-line tool. 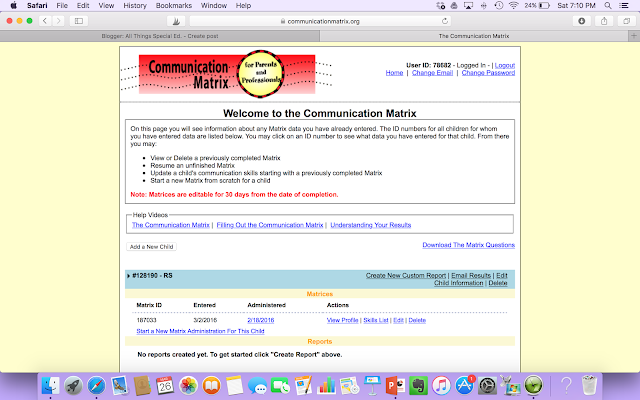 The Communication Matrix is "an easy easy assessment instrument designed for individuals fall ages who function at the earliest stages of communication and use any form of communication." EVERY student communicates- even if they are non-verbal, have quadriplegia... everyone communicates. It may not be easy to spot, and sometimes we are using our best judgement but there are little signs we need to tune into and we can use our best proffesiaonl judgment to use those to teach our students to communicate with us. The Communication Matrix was published by Dr. Charity Rowland of Oregon Health and Science University in 1990 and revised in 1996 and again in 2004. 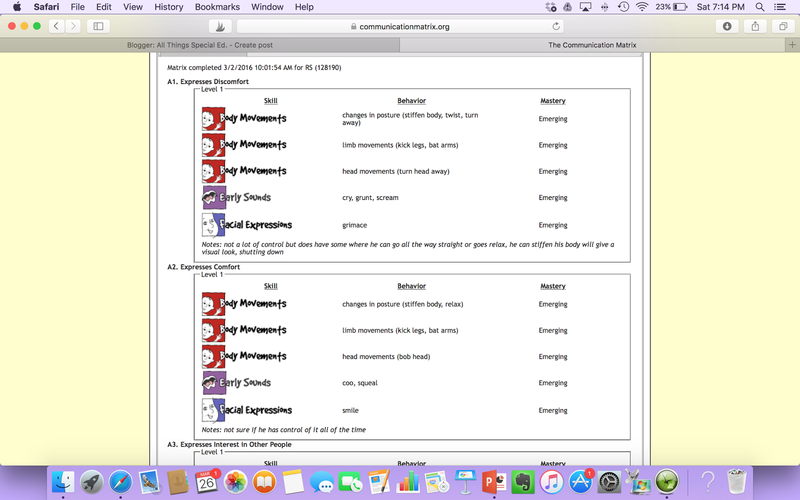 This tool was made for speech-language pathologist and educators as a tool to help document expressive communication skills for their students with severe or multiple disabilities (including those with sensory, motor, and cognitive impairments). Once you go on-line to the Communication Matrix, you will need to sign up for a free account. This is simple, easy and they do not spam your e-mail! You may also download an entire handbook in pdf that you can print. After completing your login you will be taken to your homepage where you can create your student profile and take the questionnaire to collect data and document growth over time. There are also helpful videos that you may be interested in watching to help you. The videos are: The Communication Matrix, Filling out the Communication Matrix, and Understanding Your Results. 1. As case manager, I become a little familiar with the on-line site and created the profile for the student I wanted to fill out the questionnaire for. 2. I met with the IEP (special ed and regular ed staff) team to fill out the questionnaire (can I tell you what an awesome conversation we all had about our student - AMAZING!!!) I would set aside 30-60 minutes. 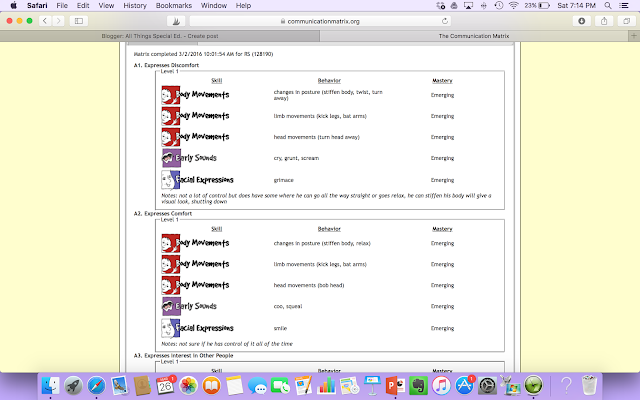 (We took about 30 minutes and only filled out 3 of the sections for the qeustionairre. The questions beyond that were skills that our student has not demonstrated so therefore not measured.) Since I was new at this, I didn't invite the parent, but I will be setting up a time to complete this with them without the team as I think it would give us awesome date to compare with one another. 3. I used a computer/lap top and read through the questionnaire aloud (and there are paper copies you can make that I gave to each staff member as well. 4. Once you complete the questionnaire, you will get a profile and a skills list for your student. The profile gives your team a great visual on the students emerging, mastered and not used skills that you can compare over time. The communication skills that are used are based on the age range of 0 through 2 years of age. The more skills your student has and gains over time, the more it will be filled out and colorful. You can go back and edit your students questionnaire for 30 days before you need to create a new one. You can also create a new matrix for your student when you want to update data. The presenter said you should do this 2-3x/school year. I think this is an amazing resource for special educators/professionals and parents. I would love to hear back from you if you have ever used this tool! Again, I was just presented this a month ago and have only dabbled my feet in it but I can't wait to use this and see growth of my students over time.